Simple, delish barbecue recipes for the whole family! What’s a proper Irish summer without a good old barbecue in the rain? Check out these fun, colourful recipes that will entice your children away from the same old cheeseburgers and hotdogs this summer! Note: When using wooden skewers, make sure to soak in water for at least 20 minutes before putting them on the grill. Instructions: Cut chicken into bite sized pieces. Mix soy sauce, honey, vegetable oil, lime juice, and garlic in small bowl. Place the chicken breasts in gallon sized bag and let marinate in the sauce for at least 30 minutes. 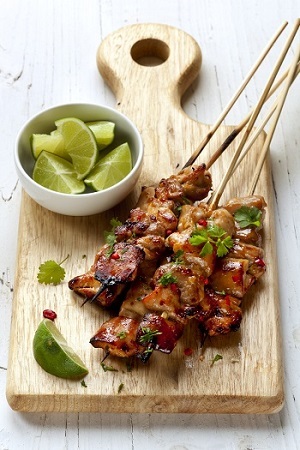 When marinated, slide chicken onto skewers. You can also slice thin slices of lime and fold in half and slide in between chicken. Baste chicken with sauce once you place them on the grill. Grill for 5-10 minutes on each side until no longer pink in centre. Instructions: Pulse the basil, garlic, pine nuts, Parmesan, oil, lemon juice, salt and pepper in a food processor or blender until smooth. 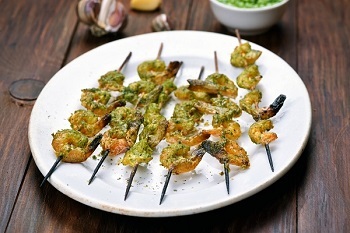 Marinate the shrimp in the pesto for at least 20 minutes, up to overnight, in the fridge. Skewer the shrimp and grill over medium-high heat until cooked, about 2-3 minutes per side. Instructions: Slice courgettes into quarters, lengthwise. Place them all in a ziplock bag or bowl. Drizzle olive oil, 1 teaspoon salt, pepper, 1 tablespoon lemon zest and the juice of two lemons. Coat courgettes in the marinade and set aside for 15 to 20 minutes. Grill the courgette on all three sides until tender, being careful not to burn them. Remove the zucchini to a plate as it gets done. 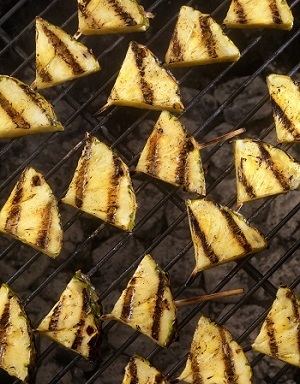 Instructions: Chop fresh pineapple and watermelon into chunks and slide onto pre-soaked skewers. Whisk together pineapple juice and coconut milk and baste on the fruit kabobs. Grill 3 minutes on each side or to taste. Instructions: Peel and slice the banana lengthwise until it’s slightly open at the top. 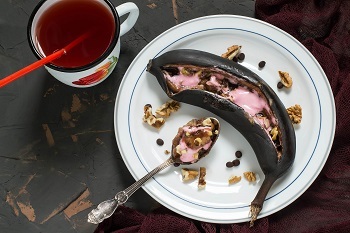 Place banana on a piece of tinfoil and place toppings inside and on top of the banana. Close the tinfoil over the top and grill for 5 – 6 minutes on a medium grill. Let stand for one minute after grilling to cool before serving.